What's the real impact of testifying at a major hearing? “Nobody ever thinks they are going to die. They all think they will survive and see their families again, but then it just happens,” Hyuck told me years later when he was living in Seoul. He had returned not long before from a human rights conference in Warsaw where he testified. Afterward he toured Auschwitz and noted the parallels with his own experience. 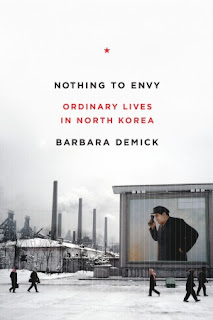 In his labor camp, nobody was gassed — if they were too weak to work they were sent to another prison. Although some were executed and some were beaten, the primary means of inflicting punishment was withholding food. Starvation was the way the regime preferred to eliminate its opponents. Hyuck’s story is harrowing, as is Demick’s entire book. But maybe we can take some small comfort in the fact that conferences of the type that Hyuck attended in Warsaw are helping shine a light on situations like this.